The rate of photosynthesis increases when light gets brighter. 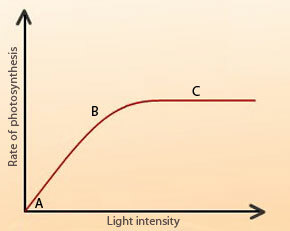 The rate of photosynthesis increases linearly with increasing light intensity (from point A to B on the graph). Gradually the rate falls of and at a certain light intensity the rate of photosynthesis stay constant (from point B to C on the graph). Here a rise in light intensity has no affect on the rate of photosynthesis as the other factors such as temperature and carbon dioxide become limiting. Many plants spread out their leaves in such a way that each leaf maximises the amount of light falling on them and the lower leaves are not shaded by the ones above. Too much light at a high intensity can damage chloroplasts. Some woodland plants photosynthesize more efficiently in dim light and are so called shade plants. 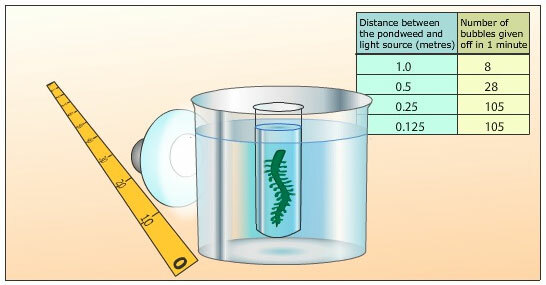 The animation below describes an experiment to investigate the effects of light on photosynthesis. The affect of light on photosynthesis can be investigated using the experimental setup shown. A water plant such as Elodea pond weed or Cabomba pond weed is placed upside in a test tube containing water. The pond weed is weighted down with a paperclip to ensure it remains fixed in position. The test tube is placed in a beaker containing water. This so the large volume of water in the beaker maintains a constant temperature around the pond weed. 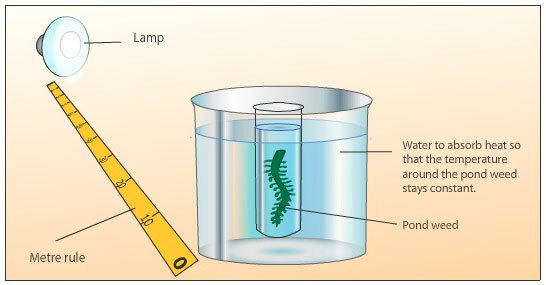 The light source is provided by a lamp and light intensity is measured by the distance of the lamp in relation to the pond weed. With light present the pond weed undertakes photosynthesis and gives of oxygen gas which can be seen as bubbles. By counting the number of bubbles given of in a fixed time period for e.g one minute the rate of photosynthesis can be determined. At the start of the experiment the lamp is positioned 1m from the pond weed and the number of gas bubbles produced is recorded. The lamp is then brought closer to the pond weed and the respective distance and number of bubbles recorded. 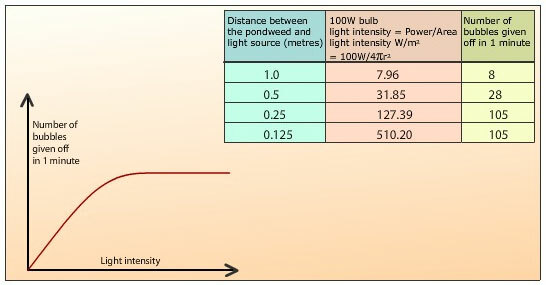 In this experiment a 100 Watt bulb was used. As the bulb emits light in all direction we use the area of a sphere with the radius being the distance from the pond weed. The number of bubbles given off in a minute is taken as the rate of photosynthesis and plotted against the calculated light intensity. From the graph it can be seen that the rate of photosynthesis increase with light intensity to a point until the other factors such as carbon dioxide and temperature become the limiting factors.